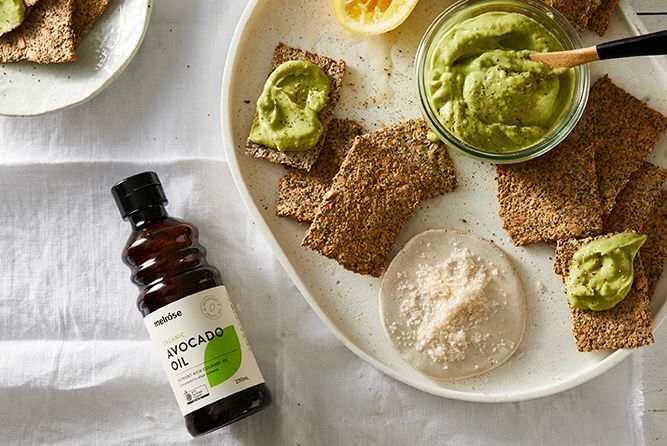 To make avocado dip, place avocados, garlic, lime juice, unhulled tahini in food processor and blend till smooth, season with salt and set aside. For the flax crackers, preheat oven to 180 degrees. Place flax meal, almond meal, chia seeds, flax seeds, sunflower seeds, dukkah, dulse flakes, salt and garlic in a large mixing bowl and stir well to combine all ingredients. Add water and stir well to combine. Allow mixture to sit and thicken for about 15 minutes, stir occasionally. Mixture should become nice and sticky so that it clumps together easily when pressed together. If it seems too dry add a little more water and stir through. Prepare two large baking trays with baking paper. Divide the mixture in half and place half on one baking tray and the remainder on the second baking tray and using clean hands, push and spread the mixture out evenly across the baking tray so that mix is about 5 mm thick. Place in oven and bake for approximately 20–30 minutes, or until lightly golden. Rotate baking tray if needed. Remove from oven and allow to cool. To ensure you have even crackers, you can place a clean piece of baking paper on top of the cracker mix and use a small rolling pin or cylindrical shaped glass / cup to roll out the mix between the baking paper. If you have excess mixture on the sides, remove baking paper and trim with a small, sharp knife. Repeat on the other baking tray.